Usain Bolt Parties With Drake At Summer Sixteen Tour Stop In L.A.
Usain Bolt parties with Drake at the rapper’s Summer Sixteen Tour stop in Los Angeles on Tuesday night. Drizzy is on the final leg of his hugely successful tour with Future and he got some big name stars to come to his show including NBA stars and actors like Steph Curry, Kevin Durrant, Lebron James, and now the world fastest man Usain Bolt. 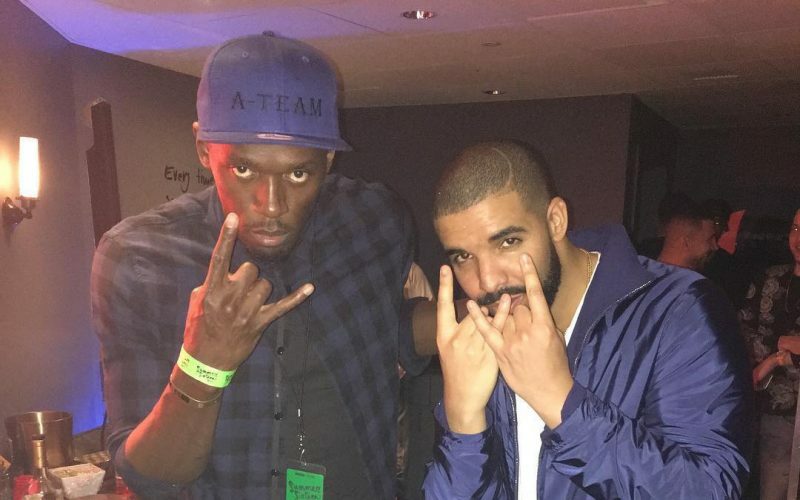 Drake and Bolt were spotted backstage having fun while giving us their best Popcaan impression. Both Bolt and the 6 God are huge fans of each other and are also huge fans of Popcaan. Usain was busy all night posting videos on his SnapChat while watching Drizzy performed in front a sold out crowd. Let’s not forget that Usain Bolt still have a crush on Rihanna so perhaps he confronted Drizzy about that.